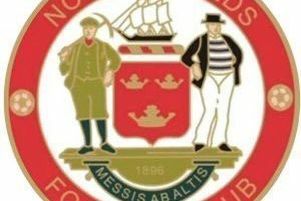 Andy Gowens has resigned as manager of Whitley Bay FC. A distinguished former player and manager of the Club in 2002 when they won the FA Vase for the first time, Gowens returned to Hillheads in February and had virtually rebuilt the side during the summer. Results this season have been inconsistent but the side enjoyed a successful FA Cup run, reaching the 2nd Qualifying Round after defeating higher ranked Whitby Town before finally going out at National League North side Altrincham. * Whitley surrendered a two goal lead against ten man Whickham and in a dramatic climax to an action packed game, they missed a stoppage time penalty which would have earned them a point. In the 23rd minute Glen-Ravenhill broke through on goal but was tugged to the ground by Matthew Grieve as he burst into the box. After consulting his assistant, referee Jack Gordon awarded a penalty and showed Grieve a red card for denying a clear goal scoring opportunity. Vigorous protests followed from the Whickham players but when calm was restored, Gavin Caines slotted home the penalty to give Whitley the lead. The advantage was doubled when Lewis Suddick curled an excellent shot from the edge of the box beyond Lister into the far corner of the net. 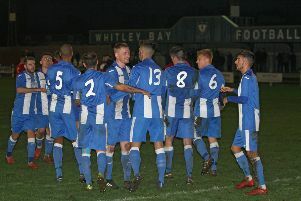 It was his first goal since joining the club and it appeared to be putting Whitley on the road to a comfortable victory. However, Whickham reduced the arrears in the 36th minute whenDale Burrell was allowed space inside the box and calmly stroked the ball past Flynn. And the teams were soon level when Bulford sent a neat lob shot off the underside of the bar on its way into the net, to make it 2-2 at the break. Seven minutes after the restart Damien Stevens raced away down the right before firing a low shot beyond Flynn and into the far corner. It then became 4-2 after 75 minutes. A header from Andre Ardelean gave Whitley some hope, but Caine’s stoppage time penalty struck the bar as Bay were denied a point.